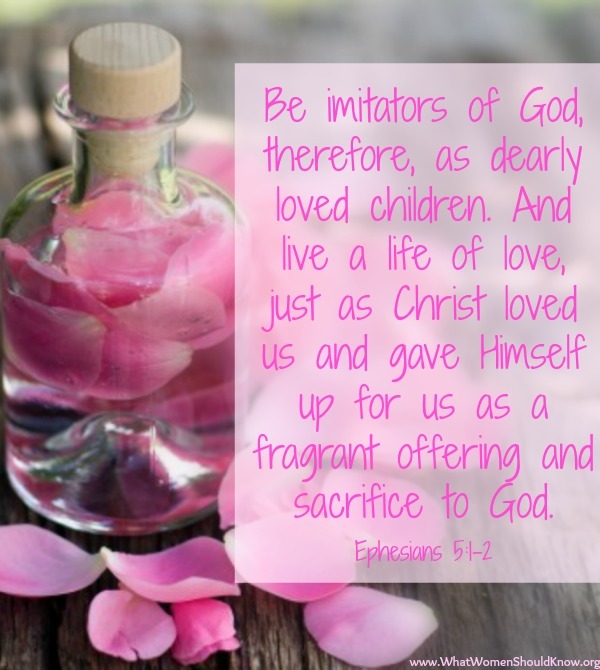 The Fragrance of Christ . . . Maturity. Sometimes we think, “Wow, I have been saved for 10 years, I should be mature already, right?” or “I have been saved for 30 years, I should be considered mature now, right?” Our dear friend Fred has walked with the Lord for decades and he says, “I have a long way to go.” When we come the understanding that we do, in fact, have a long way to go, it drives us to press in harder. It drives us to press in to walk in a manner worthy of the high calling of Christ. Yesterday, I was praying and the Lord gave me a vision. I saw the Lord standing on the earth and a river was flowing from the center of His body. This river poured out across the earth. Now the earth was nearly blackened, severely burned like a forest fire. However, this river began to pour out across the earth from His belly and it flowed out across the earth and it would come back around and into Him. It was a circular flow of water, flowing through Him and out across the earth, then back into Him, over and over again. As this was taking place, life was growing in the earth. Life. This blackened Earth started to produce life. Vegetation was growing, animals were flourishing, birds were chirping—it was a very vivid. Life comes forth from Him. As this river flowed out and came back to Him, it gained the nutrients it needed to go back out across the earth and continue to nurture the earth. Friends, we are the Body of Christ and His Spirit flows through us. We are called to bring forth life into all we touch. But the main point here is that river continued to come back to the Lord for nourishment; we cannot do this work in our own strength. We cannot do this without returning to Him because He is our source, He is the source of all we do. He is the reason we have life, He is the reason we are who we are today. He is the source and if we do not return to the source on an on-going basis, what comes out of us will cease to bring life. As I watched this I thought, Wow, Lord, that was a beautiful visual of what You’re doing. It not only shows us our absolute dependence on You to fulfill and to walk out our salvation, but the beauty that will be birthed through our relationship with You. Note: In my closing prayer, the Lord spoke to me further about this vision. He said, “The new breed of believers coming out of this year, that have been deeply refined, will carry the Spirit of Reformation.” He is releasing it to us, piece by piece, as we endure. It is a beautiful thing, my friends. All that we will do will stem from a true understanding of our salvation as He imparts the mysteries of the Spirit into us. We must allow the flow of the Spirit to continue within us to bring us into maturity. If we do, everything we put our hands to will be done in His strength, rather than our own. Imagine the freedom we can walk in, in this place! The Bible does not give us much in terms of Paul’s appearance, however, in his letter to the Galatians, he closes with references to the marks he bears in his body on behalf of Jesus. The apocryphal text refers to him as a man small in stature. He was not physically intimidating by any means, however, men feared him because he walked in the power and the authority of God. How? Because through his refining process, Paul pressed into God and God, in turn, imparted the mysteries of intimacy into Paul. The Spirit of God functioned in and through him. He was created to release the mysteries of the Spirit in order to take the Body of Christ into deeper levels in God. Today, God is drawing us into personal intimacy with Him. He knows what we need to make it through the last days. This is a year of refining, you know. As I have thought about that over the last week, I thought, “Lord, the last decade or two seem as though they’ve been pretty rough on us all—a refining in and of themselves.” As I pondered this, He began to speak to me. There is a new level refining He is doing in this hour. It is a refining of our mind, it is a refining of our heart, and a refining of our soul. This work is preparing us to walk in the fullness of what we have been created to walk in. This refining is deeply internal in areas many of us have not yet experienced, however, everything we have experienced thus far has prepared us for the depth of refining He will take us through next. Remember, all suffering is redemptive when we submit to God in the affliction. It becomes a sweet fragrance unto God. It is all beautiful, it is all precious. But what is taking place right now is deeper—much deeper—and it exposes those different layers and levels within us for God to purify. I pray every day that He gives us the grace to endure and that we each have the faith to press on. Heavenly Father, I thank You. I thank You for the promises in Your Word, I thank You for bringing forth revelation in Your Word. I thank You for releasing the treasures—the mysteries of Your Spirit. I thank You for giving us the grace to embrace all that You are giving us right now, and I implore you to help us Lord, to allow it to do a deep, deep work in our lives. Let a deep cleansing, a deep purification come forth within us, Lord, so we can walk in the fullness of what we have been created to walk in and represent our Savior in a way that touches those around us, in a way that melts the hearts of those around us and exposes the truth of Who You are. We want to be vessels for Your Spirit to flow through us and impact others, bringing life, restoration, and reformation in our nation. Prepare us Lord, just prepare us Lord—that is my heart’s cry every day. I thank You Lord. In Your precious name. Amen.